When my daughter Skyelah was born in 2009, I immediately noticed tiny red dots on her that no one took worry to while we were in the hospital. With each passing day, they would change in size and location, always smooth, not raised. With her being our fourth child, something was just off with her. You could look at her and see she didn’t look happy or act like she felt good, compared to most normal new babies’ silly smiles and cooing. Having lost two younger sisters as infants to a rare dystrophy, I was always worried for my kids. Struggling within the first week with preeclampsia and trying to succeed in breastfeeding, I was steadily sending possibilities of what could be wrong with Skyelah to her pediatrician. Some neighbor friends that were both nurses came by while I was bathing her and could see the spots. They looked up her symptoms online through the Merck Manual. We were all scared with the results, believing she had one of the cryopyrin-associated periodic syndromes (CAPS), a group of rare and severe autoinflammatory disease. I called the doctor and asked him if it was possible she had one of the three diseases within CAPS, but no one was educated in how to even begin diagnosing it. There were many routes to go down, such as trying formula in case she was getting something from me while breastfeeding, doing a skin biopsy, or being referred to a Children’s Hospital. For the next few months, we were in and out of the pediatrician’s office in person or by phone trying to get answers. We went to a dermatology clinic where they asked if she had cancer because of the inflammatory markers in her labs. Then that doctor told me not to worry so much. I was just an overprotective mom, yet he finally admitted they did not know what was wrong with her after having us try allergy meds that of course did nothing. I would not leave the house most days because she looked so bad. People would stare and some would ask what was wrong with her. Not having an answer made me feel awful, and I assumed they thought the worst of me. I beat myself up over not being able to help my baby, even now sometimes, when it seems like no one in the medical field can answer my questions regarding her symptoms. I have to just watch her hurt, flare, or cope with her issues. I can totally sympathize with parents who do all they can, because it never feels like it’s enough. Skyelah had to have so many labs done and they were only getting worse in terms of her inflammation markers. She had to have a spinal tap that I hated, especially watching her be put to sleep. Her pediatrician finally helped get us an appointment with a doctor at the National Institutes of Health (NIH) in Bethesda, Maryland that would involve a five-year research study. She was 7 months old when we flew out for answers after the mention of CAPS and prayed she did not have permanent damage, or worse, that what she had was a terminal diagnosis. We were at the NIH nearly a week with her being tested from head to toe, inside and out, physically and mentally. Again, I would have to watch her be put to sleep for an MRI. 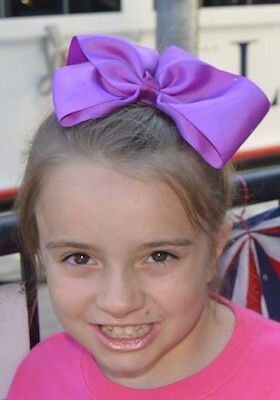 At the time, Skyelah would be clinically diagnosed with Muckle Wells Syndrome. This is an autoinflammatory disease that causes periodic fevers, rashes, eye conjunctivitis, and joint pain. 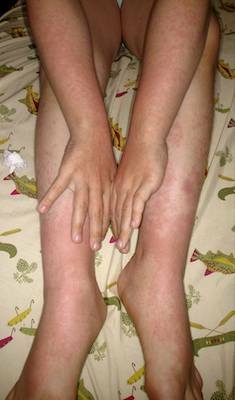 Muckle Wells Syndrome is also known as urticaria-deafness-amyloidosis syndrome (UDA), a rare autosomal dominant disease which causes sensorineural deafness, recurrent hives, and can lead to amyloidosis, in which proteins build up in tissues. She was treated with a daily injection of Anakinra. The first day she was given the medicine, within an hour or so she was cleared up! She had a beautiful complexion, was smiling, and eyes shining. She finally looked like a happy baby, and one that felt good. She was a completely new little girl. I have always had a phobia of needles, so this resulted in my husband having to give her the shots. We absolutely HATED it. We couldn’t help but feel like we were hurting her because we’ve all been poked at some point and no one enjoys it, on top of fearing what the medicine could do in adverse effects. Knowing there were so many others suffering in more serious ways, we managed. By the time we went back for her first annual visit, we were told that though the genetic test that was first done couldn’t find a mutation, it had been sent off to Japan where a slight mutation had been found. This resulted in her having an E567K mutation in the CIAS-1 gene, in the CAPS spectrum, also called somatic mosaic, that is even more uncommon with more variables. She was also changed to a different medicine, Illaris, an injection that had to be given by a nurse every eight weeks. Once on the new medicine, the break from daily shots was relieving. But over the next four years, Skyelah stayed sick in the winter months with croup, flu, strep, and upper respiratory infections. Her hair was thin and never grew—to this day she has had no hair cut yet—and her teeth had white spots. This is also when the stiffness in her joints became more obvious and worse in the knees and feet. We will never know if any or all was a result of the medicine or not. After we quit going to the NIH and trying to let her have a break/cleansing of meds, I can say Skyelah went nearly seven months before starting to show signs of flares again, either with low fevers, spots, or conjunctivitis. We then decided to go back to the Anakinra injections because I felt they were safer since the medicine only stays in her system a day versus eight weeks. This go around, with her being older and fighting the shots more, my husband refused to give them, forcing me to get over my fears and just do it. But I still HATE it. I can’t count the times she and I both wind up in tears. I’ve learned a lot since her birth dealing with medical doctors and medicine, both good and bad, and have tried to make personal changes within my family accordingly. Skyelah has many things we struggle with or that are concerning. I lean toward blaming the unknowns on Muckle Wells because they are things none of my other children experienced. There is no rhyme or reason for how things never match up in order to identify the cause or how to correct it. Her labs are all over the place no matter what we do. She’s limited physically and has permanent damage in one of her ankles, I believe from braces she was wearing. The bad thing is I questioned her behavior, not knowing if she was just whining or really uncomfortable in wearing them, which resulted in me feeling guilty. She wakes up shaking with chills and her teeth chattering in the wee hours sometimes if her shot was missed or off schedule. Skyelah complains of her tummy hurting all the time and has headaches often. She has anxiety on doctor appointment days and many times during her shots. Drinking enough fluids is a constant battle with her and could be why ultrasounds have shown debris in her bladder. We’ve had her wear a heart monitor as a precaution to her complaining of her heart racing and beating hard. These are just a few things we deal with regularly. I can say we never have a dull moment in our household, always having plenty of excitement. Most of her new doctors know nothing of her disease; some do a quick scan of the definition before meeting us, while others just ask what it is. This is both aggravating and unprofessional, as nothing gets accomplished and is just a waste of time. We try not to go to our local ER because once I tell them about her disease they shut down and only do what’s necessary before referring us back to her specialist. I say this so others can relate that they will have challenging experiences, but I encourage them to not give up. We have to fight and pray the ones that truly desire to help people will learn and educate themselves like everyone should, whether it be in common illnesses or rare. We have witnessed medical professionals that go above and beyond, just in the simplest of gestures that gives us that hope in the way it should be. I’ve confronted my disappointment to one of her doctors, and he apologized that he did not handle us correctly because he did not know how, and we have been on the best of terms ever since. THAT does not happen often. He and his nurse take good care of us now; I can call or email him with questions anytime, and we feel blessed for that. Another doctor gets face-to-face with Skyelah, involving her, and calls me personally when her test results are not so good. Some staff members give Skyelah special attention at just the right time and it is so appreciated. These relationships need to be stronger because when the situation is more serious, we are figuring things out as we go, together. In order for her to survive, medical professionals have to be on top of their game with all new updates possible, and in order for them to succeed we have to keep an open line of communication with what’s going on with her. As alone and scared as I was in the beginning, even still today, always afraid of the “what ifs,” I am coming to a point in life where I try to accept that our situation. It will always be one of no hard proof answers, no possible cure, no alternative medicines, no painless or safer options, and symptoms and health issues that may or may never be determined to be linked to this disease or be fixed. Our journey with Skyelah and what she goes through will always be shared with those who love her. She is an angel of strength and example with what she endures, my personal hero. Most importantly, she loves God and prays daily for a cure and no more needles! Skyelah is a blessing in all of our lives. Though there are moments of utter chaos or panic, she has brought an indescribable joy to us. We never know what she’s going to do or say, literally. Homeschooling is our comfort zone, though we have more tough days than easy right now. We know God will get us through it ALL. I’ve hoped to find others to compare notes with. I thought it would be nice for her, and us, to have someone with similarities to talk to. Understanding how rare Muckle Wells is, I still hope to connect with others. I try to comprehend what I can, research what I can’t, and just be the best mom I know how to be. Skyelah has a Facebook group, Praying for Skyelah Raine Truevy Rudd, that has some helpful info, links, contacts, and a way to keep up with what’s going on with her. Angela Rudd is a stay-at-home/homeschool mom, 4H leader/volunteer, and loves traveling. She lives in Bismarck, Arkansas, with her husband, Shane, of 23 years; son, Maverick (22), twins Jazzlan and Jillian (18), Skyelah (8), and they are members of the church of Christ.